A city map is a small-scale map of a city for the quick orientation within the urban space. Therefore the presentation is graphically very much simplified and reduced to commonly understandable cartographic symbols. The typical scales range between 1 : 10 000 and 1: 50 000. The solutions of AED-SICAD and its partner companies support the complete process of initial creation, updating, layout creation and print output of city maps. For this we use the ATKIS data model including the extensions created according to the regulations defined by the Working Group of the German Surveying Authorities (AdV) as an adoption of international standards. Additional specific working processes such as public transport, postal codes, school - or election districts may also be used for the creation of city maps. 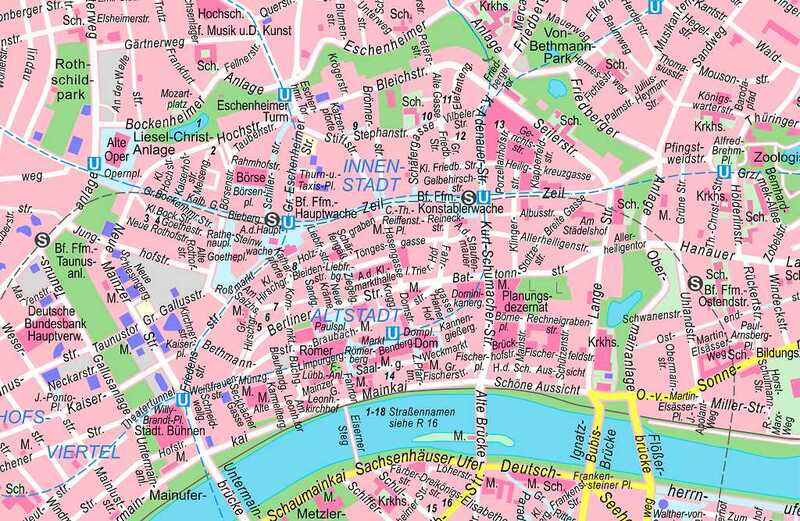 For the rapid initial creation of a city map, it is advisable to use the topographic / digital land scape model data of the relevant Federal State of Germany. Using these data, one may create city maps in different scales either interactively or with processes of the automatic cartographic generalization. The subsequent update of the city maps is typically done through the topographic field service or using the change markers of the base data.